I usually use this blog to muse about music but in the wake of the buzz surrounding the release of the American reboot of Godzilla tomorrow I thought it was appropriate to write about the greatest and mightiest movie monster of all-time (Sorry King Kong, you know it’s true). Kids have their favorite superheroes growing up. Batman, Superman, Spider-man, etc. Mine was always Godzilla. You could use the term “hero” loosely but I was solidly behind anything Godzilla did during my childhood and adolescent years. So much so that I still enjoy watching the movies even now that I’m in my 30’s. Blame it on a hyper-active imagination I guess that’s always been fascinated by the genres of Sci-Fi and fantasy. None more than kaiju/monster films with the Godzilla franchise being at the top. 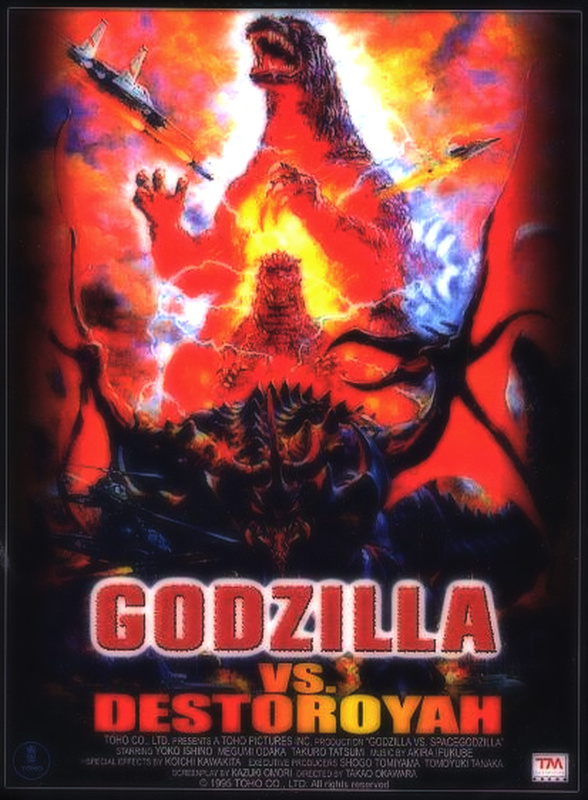 This was one of the more infamous movies in the entire Godzilla series mainly because it usually came with the tagline “Godzilla dies.” Godzilla vs. Destoroyah was the final installment in the Heisei series and it was a fantastic way to send Godzilla out in a blaze of glory. The movie begins with Godzilla wreaking havoc in Hong Kong coated in a smoldering lava glow. We come to find this is caused by Godzilla consuming too much nuclear energy and he’s facing an imminent meltdown, the results of which will be catastrophic not only to Godzilla but the entire planet. We are also introduced to a new original Toho kaiju with Destoroyah. Destoroyah is one of my favorite Heisei series foes, truly impressive in size and design and a formidable challenge and it’s origin story traces all the way back to the Oxygen Destroyer from the original 1954 Godzilla film. Eventually Godzilla suffers his untimely demise melting down in a haunting yet gorgeous requiem composed by Akira Ifukube leaving Tokyo a ghost town of radioactive fallout. All is not lost however as radiation levels drop rapidly and off in the distance we find out that Godzilla Junior has been revived by his legendary father’s nuclear energy. Now transformed into a full-grown adult by the massive amount of radioactivity he is roars defiantly ready to reign as the new king of the monsters. This was the final installment in the original Godzilla Showa series. It’s also the only movie in my Top 10 where Godzilla appears strictly as a defender of Earth or a “Good guy.” This is a sequel to 1974’s Godzilla vs. Mechagodzilla and in my opinion I think it’s the better of the two. I was always big on Godzilla overcoming seemingly insurmountable odds for a victory. Not only was he battling one of his arch-enemies in Mechagodzilla once more but he had to deal with the newest kaiju, an aquatic dinosaur known as Titanosaurus as well. Another edge it has over the original is the constant use of Akira Ifukube’s classic Godzilla march, one of the best orchestrations in cinema in my opinion. Godzilla triumphs in the end and saunters off into the ocean peacefully for a fitting close to the first chapter of Godzilla movies. He would not appear again on the big screen for nine years. 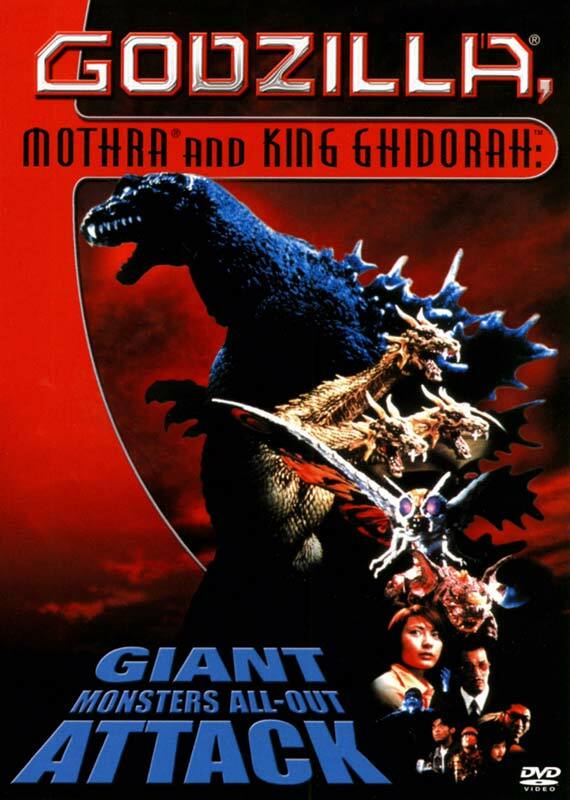 Despite the completely ludicrous title, Godzilla, Mothra and King Ghidorah: Giant Monsters All-Out Attack is widely heralded as a success from fans and critics alike. Although I’m nowhere near as big of a fan boy of it as some (Many Godzilla fans consider this to the pinnacle Godzilla movie, that’s going a touch too far) but it demands to be included in this Top 10. This incarnation of Godzilla is much different from others as it has a more spiritual spin. It is thought that Godzilla is driven by evil spirits, the lost souls of World War II are embedded within him and intend to seek vengeance on Japan for the nation apparently forgetting their sacrifices. Even for a Godzilla movie that’s pretty far out. Luckily it doesn’t clutter the film up really as Godzilla is back to being the unstoppable unforgiving force he was in movies like Godzilla and Godzilla 1985. Godzilla faces the three guardians of earth: Baragon, Mothra, and King Ghidorah. After making quick work of a completely outmatched Baragon, Godzilla has a showdown with Mothra and King Ghidorah. Eventually defeating both monsters it frees the spirits of all three earth guardians who enter Godzilla’s body dragging him down to the depths of the bay. Godzilla has a missile planted in a gaping wound he had sustained and when it detonates Godzilla explodes underwater. Japan rejoices in the apparent demise of Godzilla although as the camera plums the deepest fathoms of the water at the end of the movie we come to find Godzilla’s heart… still beating. I should also note as far as Godzilla suits go this is one of the most malicious looking. Particularly the completely white eyes and snarling demeanor restoring his wickedly ominous presence. Of all of Godzilla’s arch-enemies, King Ghidorah is considered his apex rival. Godzilla has fought King Ghidorah more times than any other adversary throughout the decades. 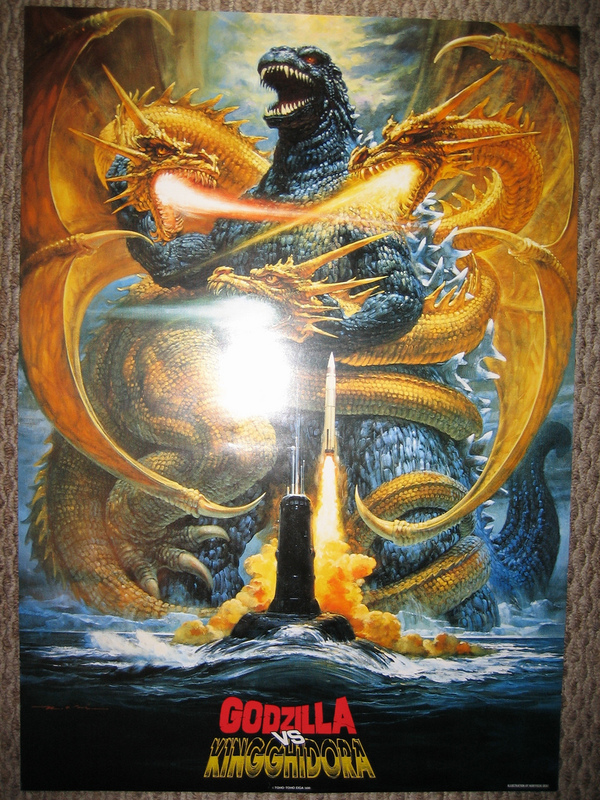 It was tough for me to narrow it down, but their greatest clash on the big screen has to be the Heisei interpretation of Godzilla vs. King Ghidorah. There is a bit of campiness with the aliens known as the Futurians (Christ what is with those suits and that horrible android?) but Godzilla and King Ghidorah represent in grand fashion to lift the movie above that slight snag. They engage in two fierce battles, the first of which sees Godzilla severely maim King Ghidorah thrashing its wings and severing its middle head. King Ghidorah is resurrected as a cyborg using futuristic technology to create the majestic Mecha-King Ghidorah. A 2nd battle ensues in the steel and glass canyons of Tokyo which is thought to eventually end in a stalemate at the bottom of the ocean. Godzilla however awakens on the ocean floor proving his indestructibility and superiority over King Ghidorah once more. As far as suits go, this may be my favorite design of Godzilla. It’s essentially the same exact design as the suit from Godzilla vs. Biollante only more musculature and intimidating. King Ghidorah is a sight to behold as well. The great golden dragon from the deepest darkest depths of space has never looked more astonishing. Okay okay, while he may have had the better one on one battles with King Ghidorah as stated above (Godzilla vs. King Ghidorah) my favorite movie with him still remanis Godzilla vs. Monster Zero. It is the 2nd appearance of King Ghidorah in the franchise and is a loosely based sequel from 1964’s Ghidorah: The Three-Headed Monster. 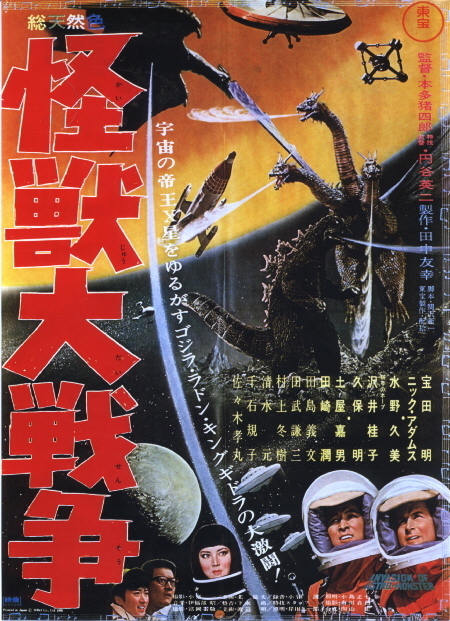 This time around King Ghidorah is under the control of evil space aliens from Planet X known as Xians. Relying heavily on numbering things, they have given King Ghidorah the code name of Monster Zero. The Xians deceive the people of Earth into giving them Godzilla and Rodan, using the facade that they intend to drive Monster Zero away from Planet X with help from the two monsters. The ulterior motive of the Xians is soon revealed as they intend to conquer Earth enslaving the human race. When mankind does not acquiesce to the demands of the Xians they unleash not only Monster Zero but Godzilla and Rodan as well as they now too are under the same mind control as King Ghidorah. One of the reasons this is a favorite Godzilla film of mine is the dichotomy of Godzilla himself. He’s seen as both a valiant protector of earth and when under the control of the Xians he reverts magnificently back to his malevolent city-leveling ways. I also enjoy King Ghidorah’s continued presentation in such a dominant manner. Once again having to battle Godzilla and an additional monster as well as escaping to fight another day once more. 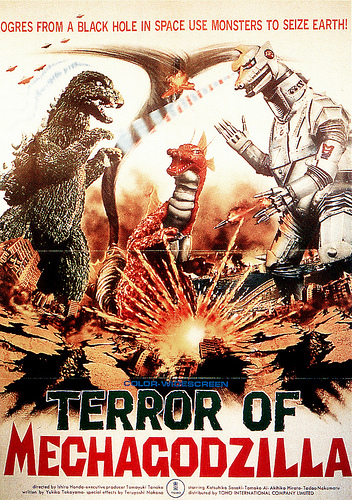 This is my 2nd favorite Showa era Godzilla movie… spoiler perhaps? If King Ghidorah is Godzilla’s most notorious foe, Mechagodzilla is a close 2nd. 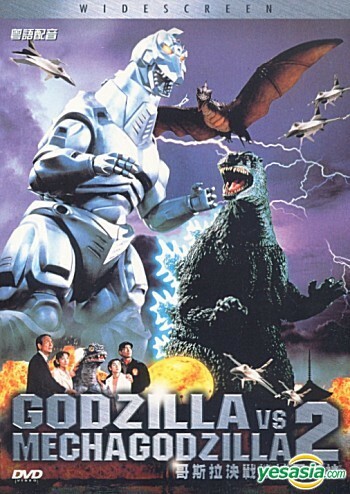 And it’s the Heisei version that captures their rivalry the best with Godzilla vs. Mechagodzilla II. As far as the Heisei films go, Godzilla might have more on-camera time here than in any other in the series. He first battles Rodan on Adona Island and is able to overcome its aerial assault. There’s also an excellent 20-minute block in the middle of the movie that sees Godzilla first disable Mechagodzilla with a massive pulse of energy. He follows that by wiping out an entire army with ease before finally laying waste to Kyoto. Finally in the conclusive battle, Godzilla arrives not only to finish off Mechagodzilla but to bring a newly hatched baby Godzilla home with him. As Godzilla arrives on land, Mechagodzilla had just finished mortally crippling and wounding Rodan. The two engage in an epic showdown and Mechagodzilla here becomes arguably the closest any other opponent has come to killing Godzilla. It targets Godzilla’s 2nd brain in his abdomen which controls his mobility. They destroy the brain and Godzilla is temporarily paralyzed and seemingly defeated. However, before he parishes Rodan summons enough energy to fly over to Godzilla and land on him. Godzilla completely absorbs Rodan and his energy, his 2nd brain is completely reanimated and repaired. Godzilla is now super-charged with Rodan’s energy and becomes too much for Mechagodzilla. Godzilla incinerates his mechanical counterpart with a high-powered red atomic ray. Godzilla is united with his estranged son and the two wade off into the ocean together peacefully. What can be said about Mechagodzilla? In every movie he’s been in he’s pushed Godzilla to the extreme brink. Always equipped with an onslaught of weapons and the latest technology (Whether it be alien or man-made) able to go toe to toe with the king of the monsters. Although this is not the greatest looking adaptation of Mechagodzilla (That distinction would go to the superb design of the Millennium series known as “Kiryu” in Godzilla Against Mechagodzilla and Godzilla: Tokyo S.O.S. ), Godzilla vs. Mechagodzilla II is still the most fully realized its power and potential could achieve. 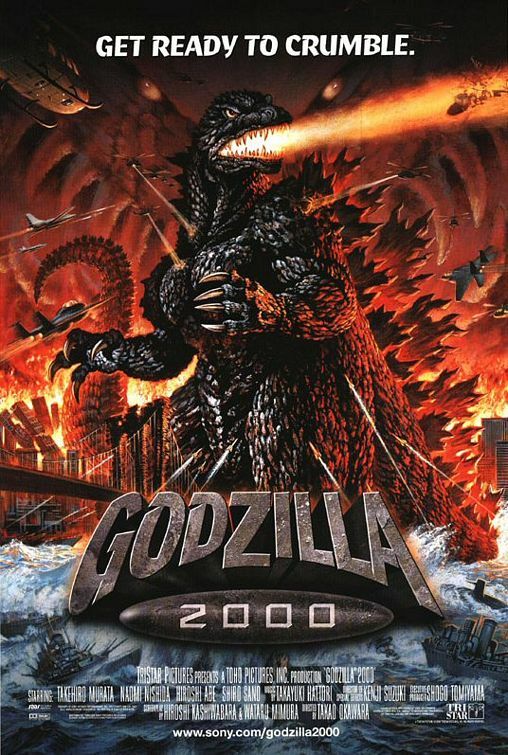 Maybe it’s just me but Godzilla 2000 has always seemed underrated and under-appreciated in the great Godzilla pantheon. After the disastrous 1998 American take on Godzilla by Dean Devlin and Roland Emmerich had severely mangled the franchise something had to be done quickly to stop the bleeding. Godzilla 2000 arrived just a year later and wiped out the sour taste of Devlin and Emmerich’s folly like a city in Godzilla’s wake. It restored prominence to the franchise and was a proper reboot that kicked off the Millennium series. Godzilla’s appearance was updated for the turn of the century as well. He’s much more reptilian looking (He’s actually green in this film), his spines were larger and more jagged with a hue of purple outlining them, and his classic fluorescent blue atomic ray was replaced with an incendiary orange beam. Also, one of my favorite enemy monster designs happens to be Orga, an original kaiju conjured for the Millennium series to combat Godzilla in this relaunch. He’s a blend of alien genetics and Godzilla’s DNA to create a truly imposing adversary. He pushes Godzilla to the limit but he makes one of the biggest mistakes in the Godzilla playbook: Do NOT put Godzilla in your mouth. You will pay dearly. Godzilla stands triumphantly over a fallen Orga and a burning Tokyo skyline at the end as the Godzilla march begins to play while the credits roll. A fitting closing for the movie that from my perspective saved the franchise from the evil grasp of Devlin and Emmerich and ushered in the outstanding Millennium series. Godzilla films have connected on a number of different levels and different ways through out the years. He’s been a loveable childhood character and on the opposite side of the spectrum he’s been a ruthless unstoppable force, uncaring, unflinching. For me I always appreciated the more serious toned films (All within perspective here, we’re talking about monster films) rather than the campy cheese-ball kid-aimed ones. Even as a child I preferred the more dour stories so it should come as no surprise what my top three Godzilla movies are. Godzilla vs. Biollante is one of the better cohesive stories told in the entire series as it’s a direct sequel to Godzilla 1985. Godzilla cells are recovered from the ruins of Tokyo and are used in an attempt to create an Anti-nuclear bacteria to use as a primary weapon against Godzilla should he ever return. Godzilla is in fact resurrected from his volcanic tomb and looks to wreak havoc on Japan once more. Meanwhile, the recovered Godzilla cells fuse with plants in a lab to create one of the most intriguing Godzilla foes, Biollante. After Godzilla easily takes care of Biollante in a rose form in their first battle, its 2nd incarnation is much more terrifying. A massive crocodilian-like head,Venus fly trap tentacles, an acidic sap spray it spews from its gargantuan mouth, and the sheer bulk of its body are impressive in scope. Godzilla comes out on top again as Biollante morphs into a spiritual stream of glimmering dust and retreats into the sky. It should be noted that the basic entities of this Godzilla suit were so well received that this design (Still considered the best by many including me), although tweaked at times, remained as a constant for the rest of the Heisei films. Godzilla’s head was much more feral than ever before, his eyes were smaller and blackened, two rows of carnivorous teeth were added as opposed to one, and an imposing muscular build to show off the king of the monsters in his true glory. 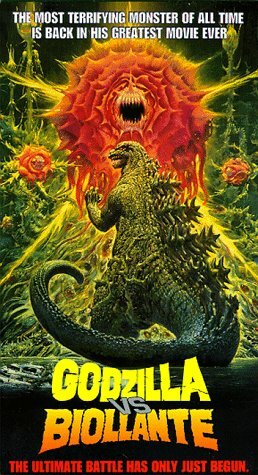 If Godzilla vs. Biollante was a solemn affair, its predecessor Godzilla 1985 was downright austere and incredibly bleak. Ignoring all previous Showa series movies except for the original 1954 outing, Godzilla 1985 was a sequel 30 years in the making. 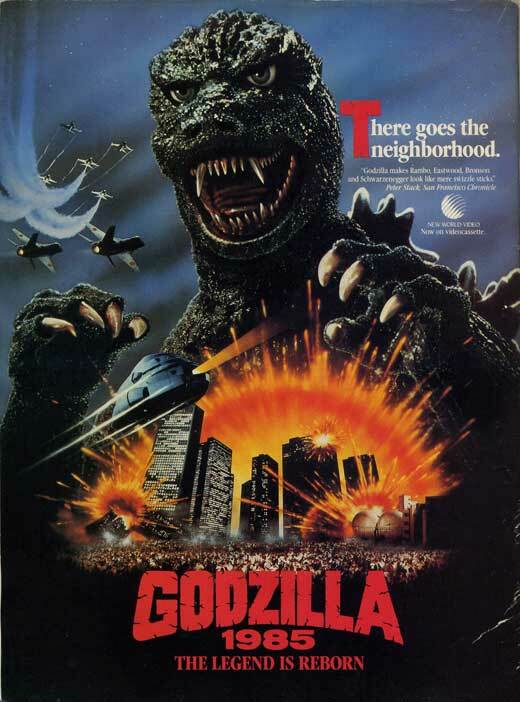 This is the movie that got me into Godzilla. Watching it as a little kid for the first time when I was 5-6 years old I was hooked, I was so engrossed and knew this was something more than just another monster. This was truly the king of the monsters I was watching. After becoming a savior of mankind in the latter appearances of the Showa series, Godzilla returns here as a callous force of nature. This was the beginning of the Heisei series as well which I consider the greatest stretch of Godzilla films (Notice five of the seven have been in my Top 10). The action begins with a fishing vessel being caught in strong currents off the shore of Daikoku Island. There is a volcanic eruption and the ominous roar of a ghost from the past echoes over the ocean. Speculation begins to run rampant that it is Godzilla. To avoid mass panic the news of a possible Godzilla return is kept a secret. The film is also rife with Cold War subplot as Godzilla destroys a Soviet submarine in the Pacific Ocean. The Soviets believe Americans were behind the attack until Japan intervenes and announces it was Godzilla to avoid an international incident. Godzilla first makes land attacking a nuclear power plant off the coast of Japan where he absorbs all of the nuclear reactor’s energy. Shortly after, Godzilla arrives in Tokyo Bay where military forces confront him only to be annihilated by Godzilla’s atomic blasts. Meanwhile the Soviets attempt to destroy Godzilla themselves with a nuclear missile fired from an orbiting Satellite. Godzilla meanwhile makes his way through Tokyo demolishing everything in his way. It’s only until he meets the new defense force weapon Super X that they are able to slow him down and temporarily subdue him with cadmium shells. American forces are able to intercept the incoming Soviet missile with a defensive missile strike of their own detonating it in the atmosphere. This however creates an electrical storm, and serving as a lightning rod, it strikes Godzilla multiple times reviving him. Godzilla relentlessly chases the Super X and appears unstoppable, destroying it by knocking a skyscraper over on it. Godzilla continues his assault on Tokyo until he is eventually lured to Mt. Mihara by a frequency similar to a bird call that had lured him away from the nuclear power plant earlier. Upon arrival Godzilla falls into the volcano after a man-made eruption and his defiant roar seemingly morphs into a sympathetic cry. Godzilla had once again been thwarted by mankind. The victory would not last as this turned out to only be a hibernation for Godzilla. Although the Godzilla design from Godzilla vs. Biollante – Godzilla vs. Destoroyah continues to be my favorite, the 1985 version is nearly as impressive, particularly the head. Godzilla’s teeth are sharpened, the snout shortened, and the eyes are baleful with intoxicating indifference. Truly a sinister design for perhaps the darkest Godzilla movie ever. It’s the movie that started it all, and for me the original 1954 Godzilla still remains the benchmark of the entire series. Six decades after it, Godzilla is still ingrained in our collective consciousness. Not only would every Godzilla movie going forward be measured to this masterpiece but every large-scaled monster movie made after this would be judged against this. Godzilla is so ominous and foreboding that it even sometimes teeters more on the boundaries of a horror movie than a Sci-Fi flick. A lot of this was due to the gritty black and white of the film. I’ll always have that image indelibly etched in my mind of Godzilla’s inaugural arrival in Tokyo, his silhouette towering over the city as Akira Ifukube’s masterfully pernicious score churns like Nero playing the fiddle while Rome burned. Using Godzilla as a metaphor for the nuclear atrocities of war and the dropping of the atomic bomb on Hiroshima just nine years before was a brilliant allegory as well. The plot begins with boats mysteriously being set ablaze and disappearing in the Pacific ocean. Villagers on the remote Odo Island believe this is being caused by a mythical creature known as “Godzilla” that they used to worship. Reporters remain skeptical until the monster makes his first ever appearance looming over a mountain on the island as everyone flees in terror. Godzilla inevitably makes his way to the Japan mainland and attacks Tokyo. Although his first attack is brief his unrelenting power is evident and there is a certainty in the air that he would return again. Shortly after Godzilla does indeed return and he tears through the first line of defense of high tension wires coursing with 50,000 volts of electricity, melting the towers with his atomic breath. He marches inland towards Tokyo where military weapons are powerless to stop him. Godzilla obliterates everything in his sight and turns Tokyo into a sprawling conflagration. Jets are finally able to annoy Godzilla enough to drive him from Tokyo but not before the city is completely destroyed. After all conventional weaponry fails against Godzilla officials turn to Dr. Daisuke Serizawa and his invention the Oxygen Destroyer which disintegrates oxygen atoms and organisms die of asphyxiation. Serizawa reluctantly agrees to use his invention against Godzilla but burns all of the blueprints for it so no one can follow his work. They find Godzilla in the ocean and unleash the Oxygen Destroyer underwater. The device proves effective as Godzilla suffocates and drowns. Serizawa stays underwater and perishes as well with his own instrument of death. No one could’ve predicted the legacy of Godzilla that would follow his inception in 1954. If they did they probably wouldn’t have killed him off in the first movie. Even in death though Godzilla couldn’t be stopped as this milestone and 27 proceeding Japanese films cemented his immortality. 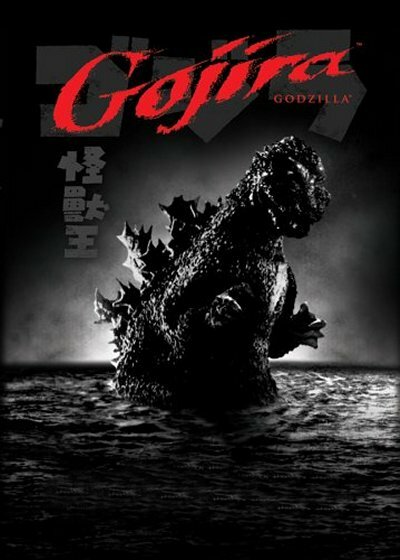 The original Godzilla that still proves to be the most awe-inspiring and galvanizing and that’s why it gets the #1 spot. So where will this new incarnation of Godzilla being released tomorrow fit in this amazing lineage? Early reviews and reports have me hopeful as it is supposedly a serious take on a newly adapted Godzilla origins story. It has a lot to live up to but here’s to hoping it is successful enough to generate a number of sequels and an American series that can hold it’s ground with the Toho Godzilla movies. Tomorrow my roaring 20’s end as they began… out on Highway 61. Only this time it’s not just on record it’s on the road. I remember the Spring of 2004, shortly after I turned 20 there was one record I listened to more than anything else: Bob Dylan’s Highway 61 Revisited. I was obsessed with it, couldn’t put it away, you’d have to have NASA total up the amount of times I have spun this record. I’ve always wanted to take a road trip down south via Highway 61, the legendary blues highway Dylan mused about and countless other blues myths and legends have occurred along here as well. This is sort of a trial run as I don’t know how much of it I’ll get to cover but the goal is New Orleans as the terminus. At some point I’d like to travel all the way from Minnesota to New Orleans down the Great River Road. We’ll see. As for the rest of my 20’s, in a rare occurrence I’ll be brief and blunt. Yeah, I had some massive highs and some crushing lows (Thanks for that one Craig Finn), put myself through a lot of gears, smashed my head into steel beams/pipes on multiple occasions (As recent as Monday! ), and did things I’ll need to be more diligent about in my 30’s. The brain trust that has mainly been on the journey with me these past 10 years know all of the hilarious skeletons and ghost stories of the ragamuffin decade. I guess I’m waxing poetic about some of this because The Hold Steady’s new record Teeth Dreams is blasting in the background right now and they do it better than anyone else. The last great new record I’ll buy in my 20’s. Chances are some of those exploits are over-embellished because that’s the way the audience needs it! Despite all of the nonsense though I did make it out on the other side a little wiser. Here’s to 30! It’s been a sensational August for live music for me, maybe my best month for live shows yet. It kicked off with The Black Keys in Council Bluffs. The first time I saw The Black Keys live it was a small venue at the IMU Ballroom in Iowa City. Then their popularity exploded and they’ve been playing arenas and headlining festivals ever since. I wanted to catch them after their new found and well-deserved mass popularity in the arenas. I knew I wouldn’t be able to catch them at Lollapalooza as they were going to headline against Black Sabbath, so this was the appetizer before Lollapalooza. They did not disappoint. They were a well-polished machine and they’ve perfected their amalgamation of gritty blues and glam rock. Partick Carney with his wiry frame bashed the drums with a propulsive primal ferocity while Dan Auerbach played ferocious and dirty guitar licks and sung in his signature soulful howl. The truly great live band, a truly great band. I hope they remain at the forefront of Rock & Roll’s royalty for decades to come. Next up was my 3rd annual trip to Chicago for Lollapalooza. It was an exciting time to be alive. I think I’ll most remember the legendary set put on by Metal Godfathers Black Sabbath. The band sounded fantastic and it’s one of my favorite live moments ever, I can’t wait to hear what they’ve new record sounds like next year. With Rick Rubin behind the helm guiding the band and producing the record it’s got potential to go down as another classic in their canon. The Red Hot Chili Peppers were another big name legendary band I’ve wanted to see that I can check off the list now. They seem forever young in their live style of play. Flea I swear is the beast incarnate on bass. Jack White closed out Lollapalooza in mad scientist, guitar wizard style with two entirely different backing bands for each of his set. I loved a lot of under card acts as well including: Dr. Dog, The Head & The Heart, The Shins, Delta Spirit, The Tallest Man on Earth, Gary Clark Jr., The Gaslight Anthem, and Of Monsters And Men. The only real crime of Lollapalooza this year was The Gaslight Anthem only getting 45 minutes to play. Ridiculous. I’m going to have to see them on their own at some point. This past Sunday I caught Dawes in the Englert Theatre in Iowa City. What a band. I was truly captivated by frontman Taylor Goldsmith. He’s rapidly blossoming into a world-class songwriter and his guitar playing was phenomenal. They played a couple new songs. I liked both of them but there was one that had this darkened lounge feel, like a Dire Straits song that I thought sounded terrific. Can’t wait for record #3 from these guys. They may be poised for a huge run, let’s hope so. …Well I’m off to Apple River now. If I survive I may have some tales for WordPress world. Stay tuned folks, it’s gonna get weird up in Somerset, WI.